Before modern technology long sea voyages created a drinking problem. 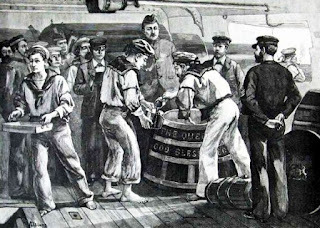 Back in the 1600's sailors were given a daily gallon of beer as their drink ration. Unfortunately the volume of the beer was a storage issue so a half pint of rum replaced the beer on sea voyages. The switch was popular among the crew but drunkenness became an issue so in 1740 Admiral Edward Vernon ordered the rum be mixed with water in a ration of 4 water to 1 rum and split into two separate servings a day per sailor. "The Admiralty Board concludes that the rum issue is no longer compatible with the high standards of efficiency required now that the individual's tasks in ships are concerned with complex, and often delicate, machinery and systems on the correct functioning of which people's lives may depend". This led to the famous House of Commons "Great Rum Debate" of 1970 which eventually concluded that the Royal Navy's daily rum ration, or tot, was deemed no longer appropriate and on July 31st, 1970, after 300 years of Naval Tradition, the final rum rations were poured at 11 a.m. (6 bells in the forenoon watch) after the pipe of up spirits*. Despite an extra can of beer being added to the daily rations, the decision was not popular among many and some took to wearing black arm bands, tots were "buried at sea" and even mock funerals occurred. 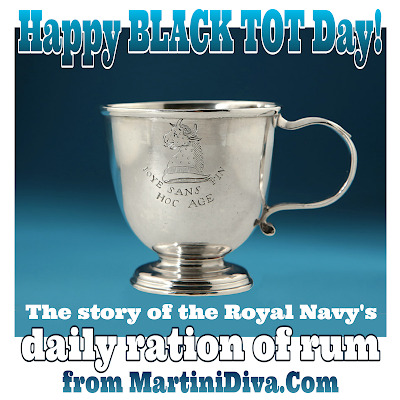 July 31st, 1970 then became BLACK TOT DAY, the last day the Royal Navy issued their sailors their daily tot of rum. Rest In Peace, Daily Tot. Take away his tot and keep him sober!